ACE Digital Marketing agency works with you to understand what your needs are . They will then create a compelling story (brand journalism) to create lead generation that will transform you and your business. 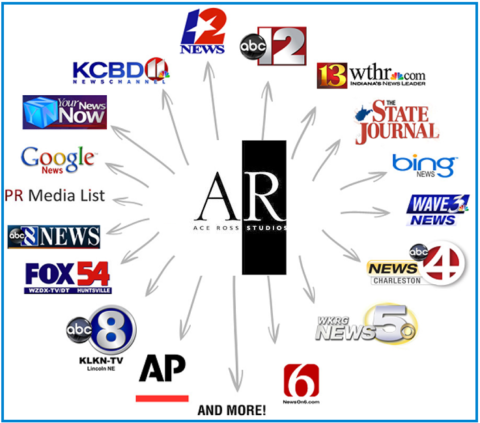 We work with more than 1,400+ Recognized Real Media Outlets. Our syndicated distribution has greater reach to more High Authority Media Outlets than competitor services can deliver. You are your brand! It is monumental for you to create the excitement and have a presence on the internet formatted for all applications. Doing something is better than doing nothing. Be FEARLESS! We offer a very affordable Reputation Management-Lead Generation Boutique. Through our proprietary software, international network of expert writers and PR distribution Network we guarantee results. A few years ago, publishing a regular Press Release with the primary keyword in the headline was a technique used by fortune 500 companies to keep themselves appearing on page 1 of Google search results. You may recall the time when Google would regularly include a Google News item on the first page of search results. Google would do this on a high percentage of the searches conducted. News of course doesn’t stay news for long, so big companies would publish news releases every month just to keep themselves in the headlines, and on Google first page. Today, Google includes a news item on page one of results less than 5% of the time. One may think therefore, that the return on investment for PR distribution has become less attractive? Not so it turns out. Press releases continue to provide some of the best bang for buck ROI a brand can get from their digital marketing spend compared to before, particularly in today’s social media marketing world a place where clumsy marketers from agencies with serious digital skills gaps are burning big brand’s spend in shotgun strategies with click frenzy enthusiasm. Lets first run through eight benefits of reputation management and lead generation then I am going to share with you the 9th, and in my opinion the most powerful white hat SEO benefit that will surely seal the deal, and have you wanting to publish a press release yesterday. Never underestimate the power of “looking good”, because after all… Sizzle Sells! It is hard to score when you don't know where the goal is. Take Action! Email or Call today.